Education expert, Alfie Kohn has written extensively about the lack of any real educational value in homework, especially for young children. In this brief video, he refers to homework, after a full day of school, as the Second Shift. After a full day of Kindergarten, homework for 5-year-olds IS just like working a second shift. Why can’t they just be 5 years old? Last night, in the Opt Out Seminole group on Facebook, parent Brandi Kitchens shared this letter sent home with her Kindergartener yesterday. For whatever reason, the school is unable to get in the 90 minutes/week of i-Ready during school and demanding, not demanding that parents see to it at home, complete with bribes galore to enforce compliance. Many parents were appalled. It was a robust discussion. While there were a few parents who stated that their child likes i-Ready, outraged is not too strong a word for what others expressed. Seminole County is not alone in this poor educational practice. i-Ready is excessively required in Orange County, Palm Beach County (here, here and here) , Miami-Dade County and many others – to the same degree. Parents in the Opt Out groups have been discussing i-Ready homework for months. And they’ve had enough. What would YOU think if you received this letter from your child’s school? When my husband and I decided to move to Florida this summer, we chose to move to Seminole County because of its solid reputation for doing what is best for children in education. Yesterday, my child brought home a letter from school informing me that SCPS is now requiring Kindergarteners to complete 90 minutes per week of Math and Reading on i-Ready. At home. The letter says that children who do not do i-Ready at home will not be punished. However they will also not partake of the rewards shared with those who put in their i-Ready hours. They will be excluded from multiple trips to Treasure Box and Fish Awards, which will be used in larger weekly prizes. Therefore, punished without calling it punishment. These children are FIVE YEARS OLD. They’ve already put in their seven hours of hard work at the office. Seven hours of being good. Seven hours of being told what to do, say and think, of “minding their manners” with other five-year olds, of sitting still and “keeping your hands to yourself,” of lessons and lining up for lunch and learning to color inside the lines. This is to advise you that my child will not be completing i-Ready at home. We will not subject him to “overtime” at home. When he gets home, he needs to tell me about his day. He needs to play and climb trees. He does not need to do MORE work. He does not need the screen time. He needs to just be five years old. 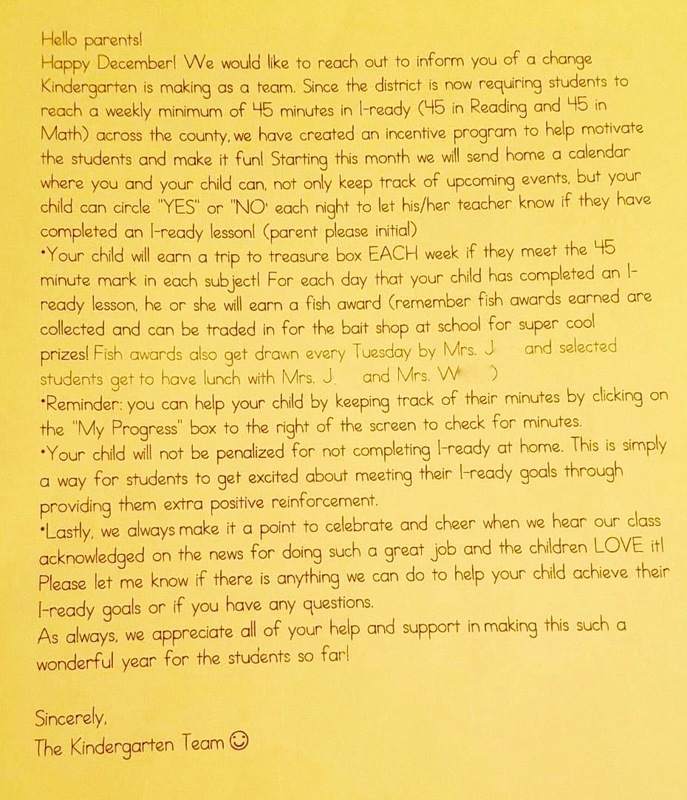 What is striking to me in the letter is that there is no mention of how i-Ready will benefit my child, only how important it is to get in his “minutes” and we will do everything possible to get in those precious minutes.” There is NO research demonstrating that 90 minutes of weekly i-Ready will improve any student’s learning. In a school year, that’s 54 hours of assessments. Just for i-Ready. Unacceptable. Furthermore, not all families are “plugged in” making this is an unfair demand. 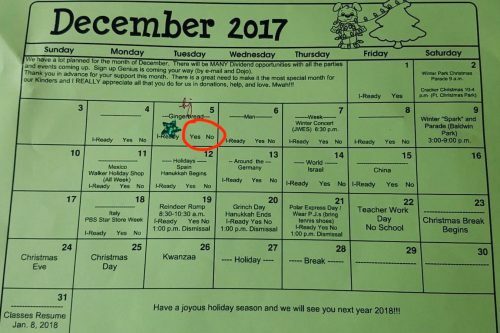 But if i-Ready is online and the school has the ability to track student time in the program, why would parents need to sign off “yes” or “no” on the calendar? This strikes me as further distancing my child from others in the class due to our inability or (disinterest) in the program. The entire “reward system” seems unfair, and inappropriate in a class full of Kindergarteners. My understanding is that i-Ready is being used to evaluate teachers. It is not any child’s job to sacrifice valuable time with his teacher for his teacher’s evaluation. I am told by an elementary school teacher of more than twenty years with a Masters degree in Developmental Psychology that there is a “standard of care” that academia and early childhood experts have concluded is best for children. And that would be NO HOMEWORK IN KINDERGARTEN. The people who know what’s best for children have determined homework is not one of those things. We do believe that running and playing outside for the hour of daylight after we get home from work is more valuable for all aspects of his growth and development than any amount of i-Ready, especially after a full day of school. We believe that helping to set the table will teach him more practical math; and reading together as a family at bedtime will help instill a love of reading far more than i-Ready ever could. Family first. There is ample research against using extrinsic motivation in school. Therefore, I hope that special treats will be shared with the entire class – just as treats, not incentives. Has it even occurred to anyone in the district to question the wisdom of i-Ready if the schools must “incentivize” participation to the extent that it does in order to get the compliance it seeks? Because we strongly disagree with i-Ready for homework, and with the use of the school’s “rewards game” to coerce five-year-olds into compliance, it is our family’s decision that he not participate. I am prepared to discuss with my five-year-old, the fact that life can sometimes be unfair, and that as his Mom and Dad, WE have to decide what is best for him. He will understand that if he is excluded from “treats or special rewards” at school, he is not being punished by his teacher – he is being punished by his school district’s questionable demands. Please restore our trust in this district and put a stop to requiring i-Ready as homework for our youngest students. Please stop demanding that schools and teachers push for the “minutes.” It is an unnecessary stress for families. This is not the norm in every district – most, but not all. In Marion County, Supt. Heidi Maier has all but banned homework for elementary grades. It’s true! A Florida school district banned homework. This IS possible in your district too. But not unless YOU demand it. Teacher Mom: Why is my Kindergartener taking End of Year exams? Are you aware of just how much your child is testing in school? Are you under the impression that the only tests being administered to children are the “high stakes” tests from the state, such as the FSA or the State End of Course (EOC) exams? Even our most informed parents are not always aware of exactly how much testing is going on in school today. Although testing is only mandated by law for grades 3-10 in Florida, ALL grades are experiencing a serious loss of authentic instructional time as a result of excessive testing now. Most districts are testing K-2 as well – to get the kids used to testing, they say, or for “progress monitoring”. The fact is that testing of any kind now is increasingly becoming a high risk activity for our youngest children. Children who do not test well, even if they are otherwise a good student, are at risk or being flagged for intervention. Districts say this is a safety net to “catch” them early. In reality, if a child is so identified, they are often made to sacrifice art, music, PE, or even recess, and are pulled for “intervention” aka “test prep” in order to make sure that our youngest children will do well on the standardized tests, which are used to evaluate teachers. Some of these assessments may be iReady, AR (Accelerated Reader), Achieve 3000, IOWA, SAT10, MAP, SuccessMaker. Districts are efficient in killing two birds with one stone by using one test to “monitor” children and to evaluate teachers. The added bonus for teachers is that they are made to do this to themselves. This letter is written by Jennifer Sabin, a parent and former teacher from Polk County. Jennifer taught Eighth Grade English Language Arts in Polk County and volunteers her time as an Administrator for the Opt Out Polk County group. When I first joined the ‪#‎optout‬ movement, I was concerned about my Third grader taking high stakes tests. I’ve slowly and shockingly come to realize that the testing culture that fuels the FSA has trickled down to Kindergarten. Why are our five and six year olds taking a test to prove they have a good teacher? Since when is it a student’s burden to prove the ability of the teacher? To that end, I am also opting my kindergartner out of her Reading End of Year exams. This test is not part of my child’s grade and only exists for the district to use in abusing their power. “I just learned that my kindergarten student is going to be taking a Reading EOY (after already taking an EOY in Art, Music, and Physical Education). I am appalled at this. I did some digging and learned this is not a state requirement which makes me even angrier. Why is Polk County doing this? My daughter’s teacher told me this test has no bearing on my daughter’s grade. To me, this means the sole purpose of this test is to evaluate her teacher. I have grave concerns about this approach to teacher evaluation and my daughter will not be taking the kindergarten EOY. I have zero confidence in the district’s ability to use the data from a test like this fairly. In fact, I have zero confidence in the test’s ability to even begin to speak to the success of a teacher. There are dozens of reasons a kindergarten student might perform poorly on an EOY, the least of which is her teacher’s success. A bad morning, her shoes are uncomfortable, disagreement with a friend on the bus, etc… To base a significant portion of a teacher’s evaluation on a single test is unconscionable. This is true at every grade level. Staking a teacher’s career on the performance of a 5 or 6 year old child on a single test does not make any sense. This is a self-portrait my daughter drew for her art class this year. Isn’t it a much better indicator of teacher competence than any silly test?